Refreshing style ideas are incorporated in the contemporary Violet Sofa by Precedent. Violet is pretty, plush and shapely with two full seat cushions and two full back cushions. 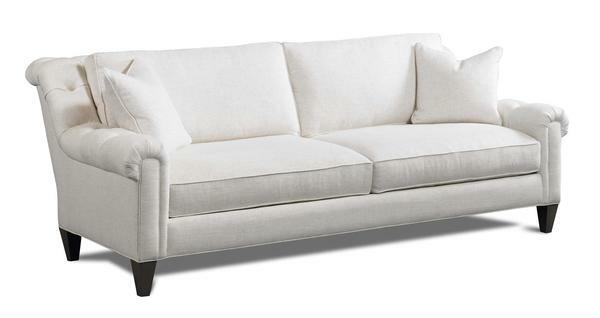 The frame adds button detail with gentle tufting along the sofa arms and top of the frame back. The Violet Sofa is graceful and her natural charm flows throughout. Crafted by Precedent who has been making fine furniture for over thirty years, the Violet Sofa is armed with all the comfort a great sofa offers along with exquisite style. Full of function and a very appealing natural contemporary design, Violet is seating ready for snuggling, entertaining, cozy napping and more.